The index opened flat and went up to touch the highs of the day within the first hour itself and stayed in a narrow only to dip to the lows around 7700 but closed flat at 7738.40, gain of 3.20 points. The broader market was positive with 784 advances to 769 declines. The range at the start of series comes to 7400-8000. 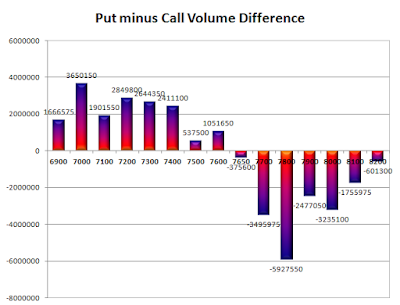 Call option 7000-8300 added 65.67 lacs OI. 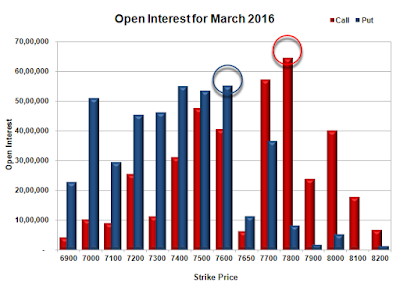 Put option 8300-7000 added 51.84 lacs OI with profit booking seen at 7100 strike price. 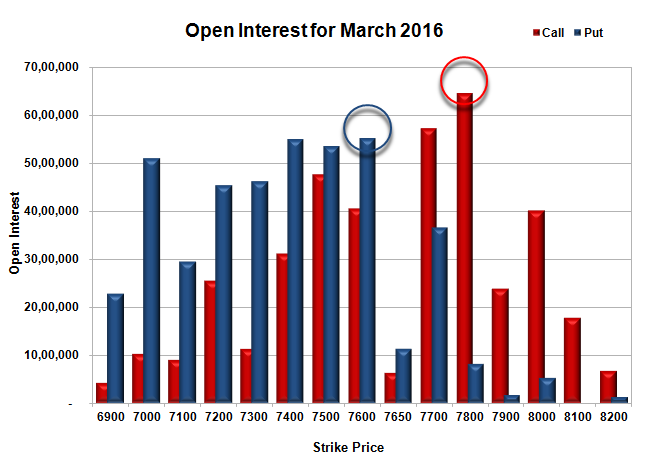 Nifty Open Interest is at 1,88,68,800 up by 46,78,125, with increase in price, 100% roll-over with huge long build-up. 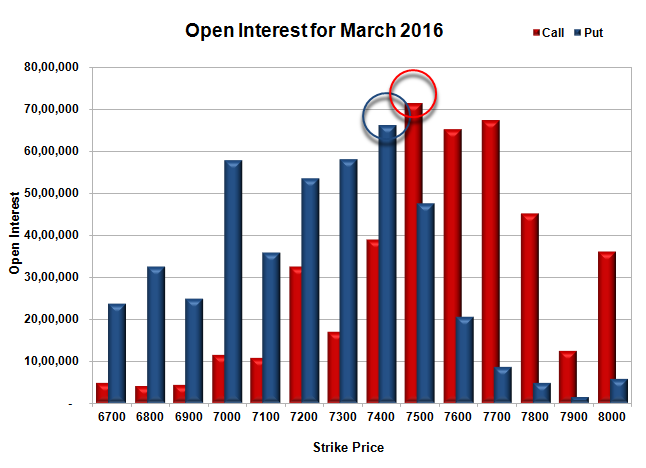 Bank Nifty Open Interest is at 16,48,110 up by 3,56,910, with increase in price, 100% roll-over with small long build-up. FII’s bought 55941 contracts of Index Futures, which includes net 96897 contracts long liquidation and 96897 contracts short covering, with decrease in net OI by 192648 contracts, includes 147379 longs to 91438 shorts for the day. 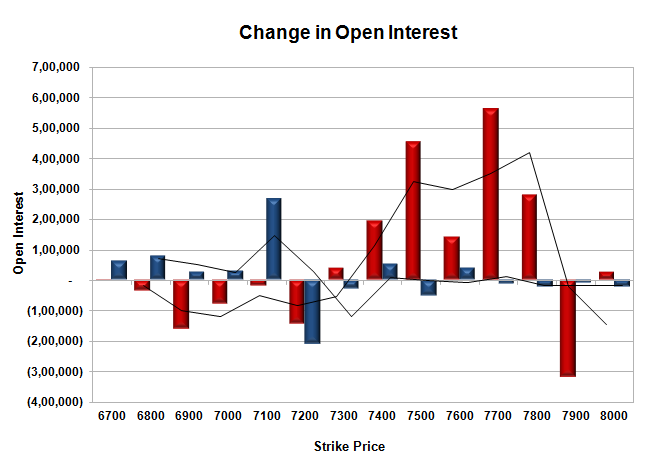 FII’s Index future open contract as on date is 173931 Longs to 64800 Shorts, Net 109131 down by 1146 contracts. 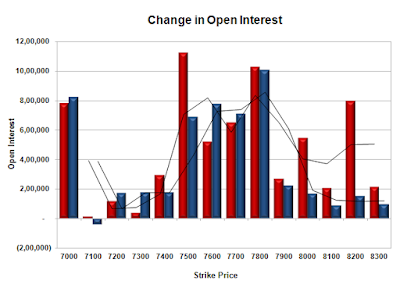 Initial support at 7700, with huge OI addition of 7.08 lacs and below that at 7600 with OI of 21.89 lacs. 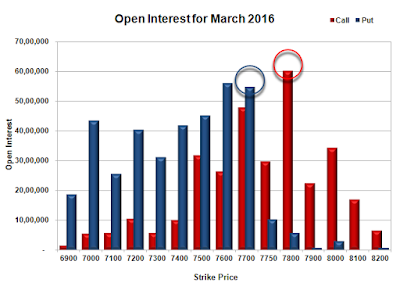 Initial resistance at 7800, with OI of 31.28 lacs and above that at 7900 with OI of 33.50 lacs. 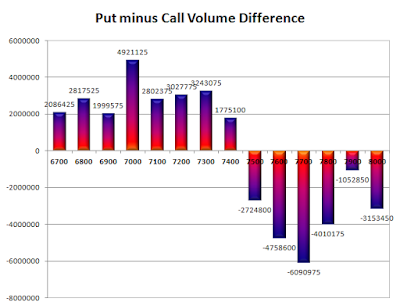 Day Range as per Option Table is 7663 - 7814 and as per VIX is 7671 - 7806 with 7739 as the Pivot. The index opened strong and stayed strong for the entire session of trade closing at the highest point of the month at 7735.20, huge gain of 138.20 points. The broader market was strong with 1235 advances to 337 declines. The range for expiry is 7700-7800. 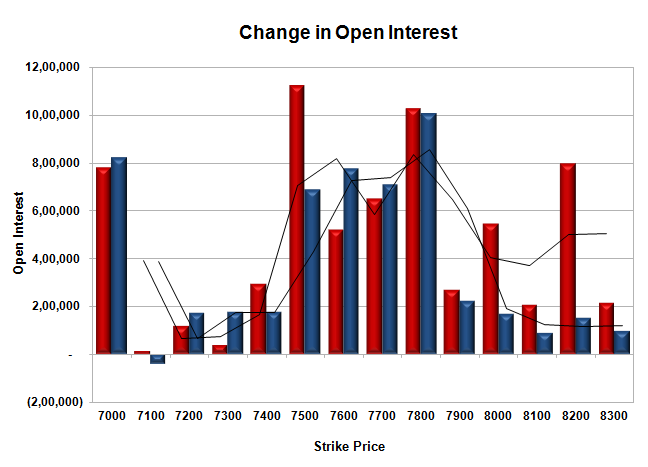 Call option 7750 added 4.66 lacs OI with short covering seen at 7700 and below strike prices. Put option 7800-7600 added huge 45.24 lacs OI with profit booking seen at 7500 and below strike prices. 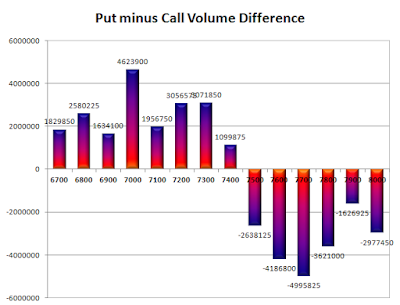 Nifty Open Interest is at 1,44,63,975 down by 15,88,725, whereas Apr series added 28.62 lacs with increase in price, 100% roll-over with huge long build-up. 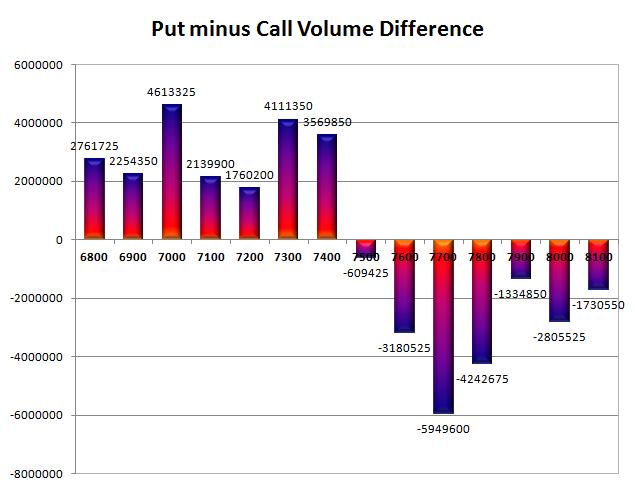 Bank Nifty Open Interest is at 12,00,420 down by 3,39,630, whereas Apr series added 3.56 lacs with increase in price, 100% roll-over with small long build-up. 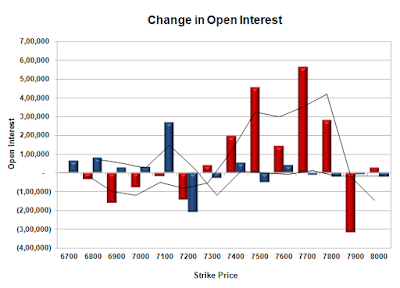 FII’s bought 1.97 lacs Futures, which includes net 27648 contracts long build-up and 19774 contracts short build-up, with increase in net OI by 47422 contracts, includes 89577 longs to 81703 shorts for the day. 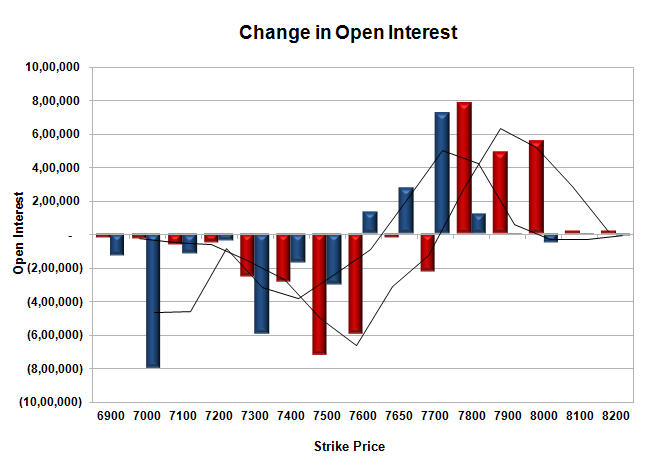 FII’s Index future open contract as on date is 270828 Longs to 160551 Shorts, Net 110277 up by 7874 contracts. Initial support at 7700, with OI of 54.68 lacs and below that at 7600 with OI of 56.04 lacs. 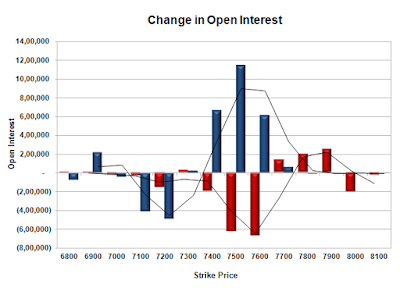 Initial resistance at 7750, with OI addition of 4.66 lacs and above that at 7800 with highest OI of 60.28 lacs. 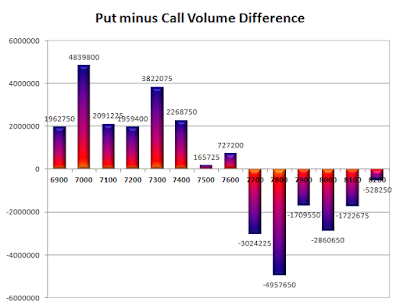 Day Range as per Option Table is 7637 - 7794 and as per VIX is 7667 - 7803 with 7707 as the Pivot. The index positive around 7741 but saw huge selling pressure from the onset to break one psychological support after another and closed just above 7600 at 7615.10, huge loss of 101.40 points. The broader market was weak with 347 advances to 1254 declines. 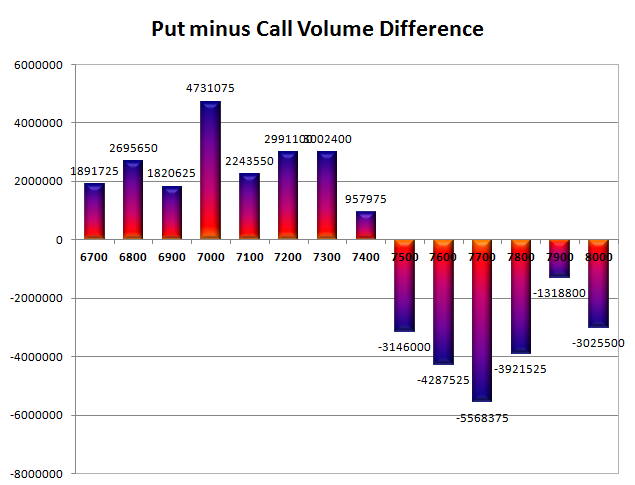 The range till expiry is 7300-7700. Call option 7600-7700 added huge 21.90 lacs OI with profit booking seen at 7800 and above strike prices. 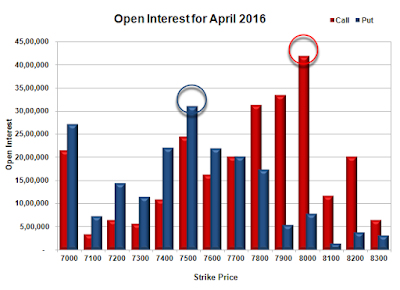 Put option 7200 added 1.04 lacs OI with short covering seen at 7600 and above strike prices. Nifty Open Interest is at 1,87,47,450 down by 29,86,875, whereas Apr series added 16.71 lacs with decrease in price, mostly roll-over with huge long liquidation. Bank Nifty Open Interest is at 20,10,990 down by 3,91,470, whereas Apr series added 1.36 lacs with decrease in price, mostly rollover with huge long liquidation. 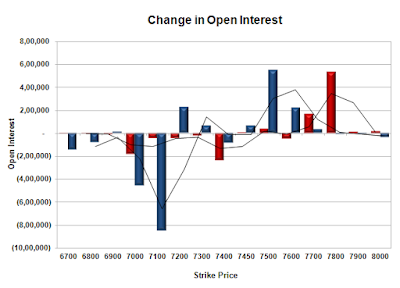 FII’s sold 0.56 lacs Futures, which includes net 17354 contracts long liquidation and 15113 contracts short covering, with decrease in net OI by 32467 contracts, includes 64464 longs to 66705 shorts for the day. 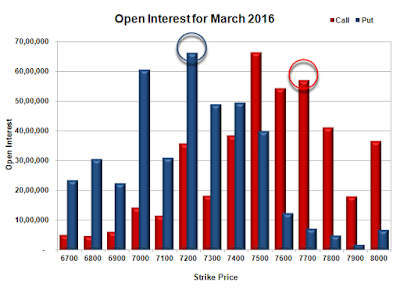 FII’s Index future open contract as on date is 212856 Longs to 114421 Shorts, Net 98435 down by 2241 contracts. Initial and best support at 7600, with OI of 49.16 lacs and below that at 7500 with OI of 46.17 lacs. 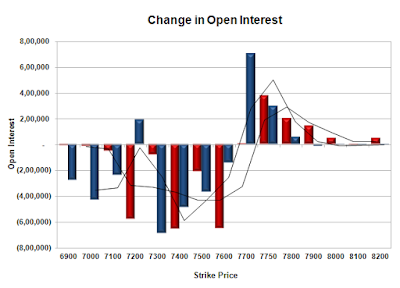 Initial resistance at 7650, with huge OI addition of 9.46 lacs and above that at 7700 with OI of 65.22 lacs. 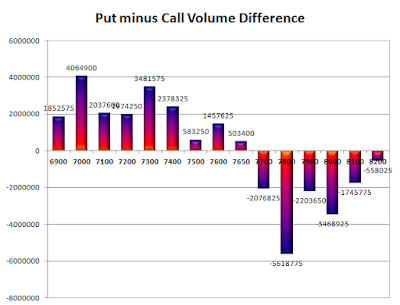 Day Range as per Option Table is 7564 - 7718 and as per VIX is 7545 - 7685 with 7651 as the Pivot. 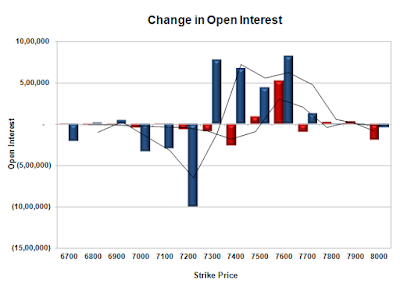 The index opened flat and stayed weak for the major part of the day only to see huge short covering towards the end of the day to close flat to positive at 7716.50, gain of 1.60 points. The broader market was negative with 759 advances to 783 declines. The range till expiry is 7300-7800. Call option 7700-8200 added 8.29 lacs OI with short covering seen at 7600 and below strike prices. Put option 7800-7700 added 10.66 lacs OI with profit booking seen at 7600 and below strike prices. 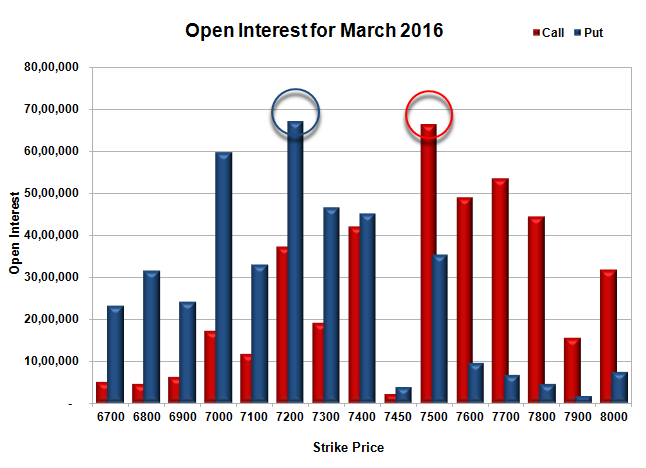 Nifty Open Interest is at 2,17,34,325 up by 6,39,300, whereas Apr series added 3.07 lacs with increase in price, most probably long build-up in both series. Bank Nifty Open Interest is at 24,02,460 down by 55,440, whereas Apr series added 0.31 lacs with decrease in price, most probably some roll-over with small long liquidation. 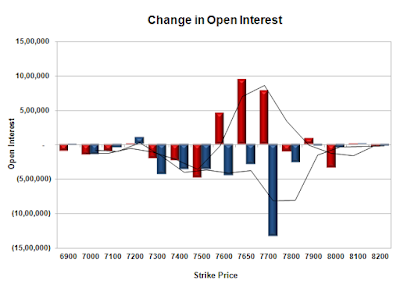 FII’s bought 3.08 lacs Futures, which includes net 7812 contracts long build-up and 4501 contracts short covering, with increase in net OI by 3311 contracts, includes 35441 longs to 23128 shorts for the day. 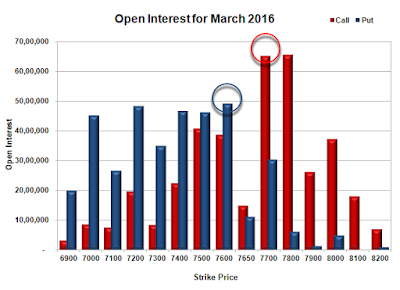 FII’s Index future open contract as on date is 230210 Longs to 129534 Shorts, Net 100676 up by 12313 contracts. 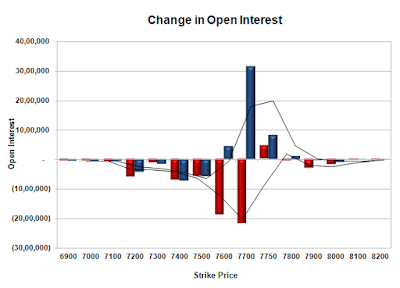 Initial support at 7700, with OI of 43.62 lacs and below that at 7600 with OI of 53.72 lacs. 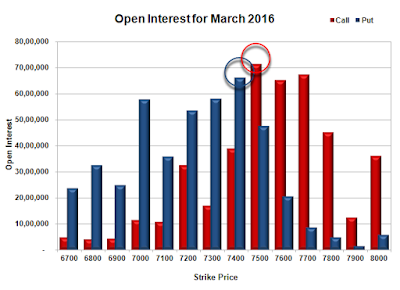 Initial resistance at 7750, with OI addition of 3.78 lacs and above that at 7800 with highest OI of 66.57 lacs. 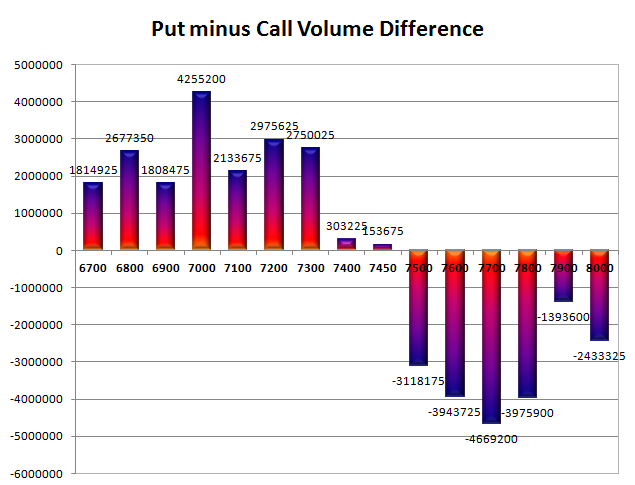 Day Range as per Option Table is 7635 - 7778 and as per VIX is 7650 - 7783 with 7705 as the Pivot. The index opened positive around 7619 and stayed strong for the entire session of trade and closed near the highs of the day at 7704.25, huge gain of 99.90 points. The broader market was positive with 989 advances to 595 declines. 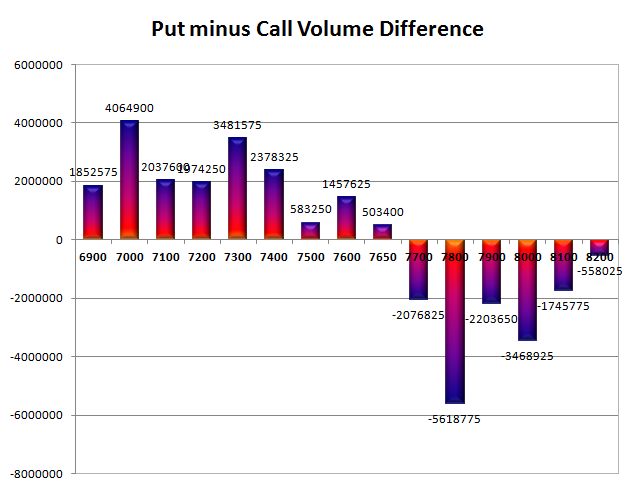 The range till expiry is 7300-7800. 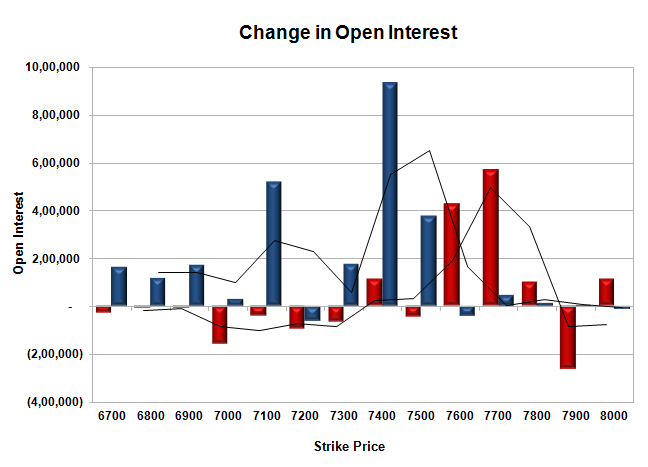 Call option 7800-8000 added 14.07 lacs OI with short covering seen at 7700 and below strike prices. 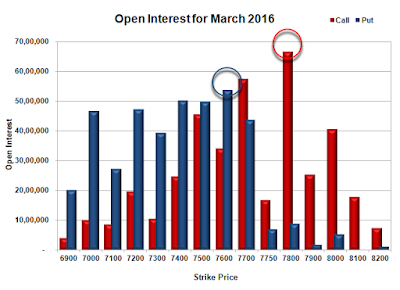 Put option 7800-7600 added huge 49.34 lacs OI with profit booking seen at 7500 and below strike prices. Nifty Open Interest is at 2,15,08,425 down by 7,51,800, whereas Apr series added 3.92 lacs with increase in price, mostly roll-over with huge short covering. Bank Nifty Open Interest is at 23,50,350 up by 1,94,280, whereas Apr series added 0.23 lacs with increase in price, most probably huge long build-up in both series. 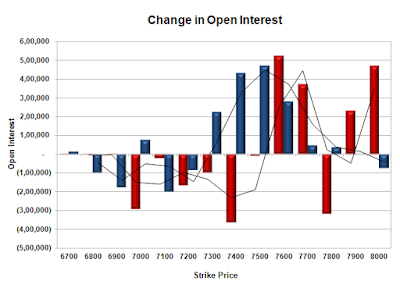 FII’s bought 0.72 lacs Futures, which includes net 4334 contracts long liquidation and 7195 contracts short covering, with decrease in net OI by 11529 contracts, includes 61152 longs to 58291 shorts for the day. 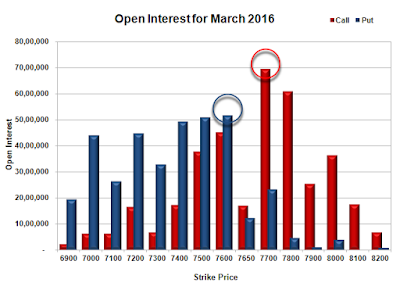 FII’s Index future open contract as on date is 217418 Longs to 131931 Shorts, Net 85487 up by 2861 contracts. 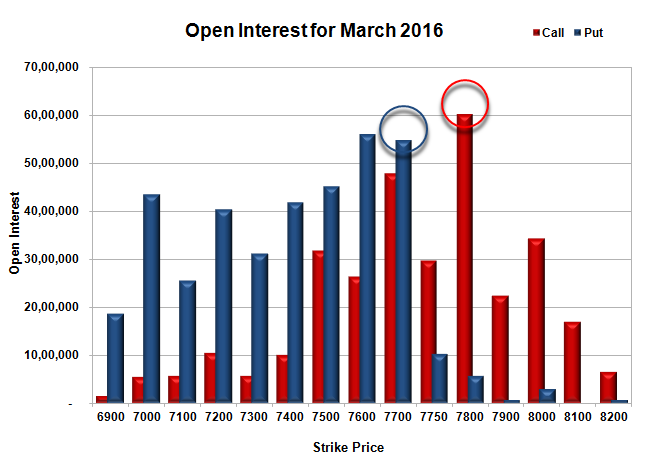 Initial support at 7700, with huge OI addition of 19.93 lacs and below that at 7600 with OI of 53.76 lacs. 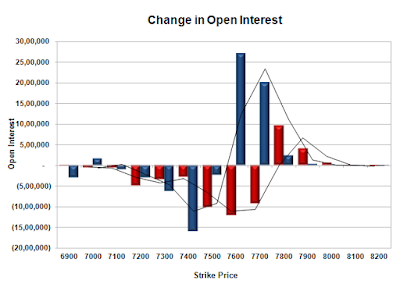 Initial resistance at 7700, with OI of 59.55 lacs and above that at 7800 with OI of 56.69 lacs. 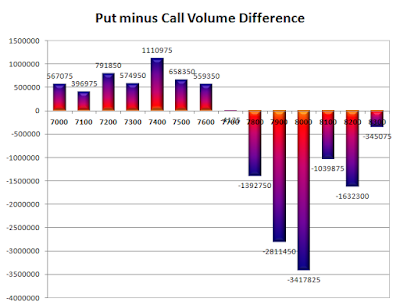 Day Range as per Option Table is 7607 - 7762 and as per VIX is 7638 - 7770 with 7679 as the Pivot. 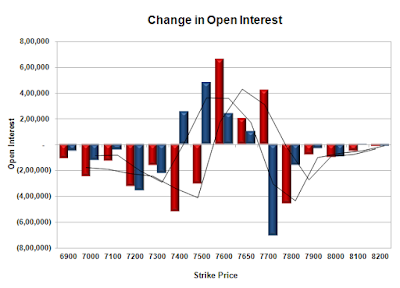 The index opened strong around 7535 and stayed strong for the entire session of trade and closed near the highs of the day at 7604.35, huge gain of 91.80 points. 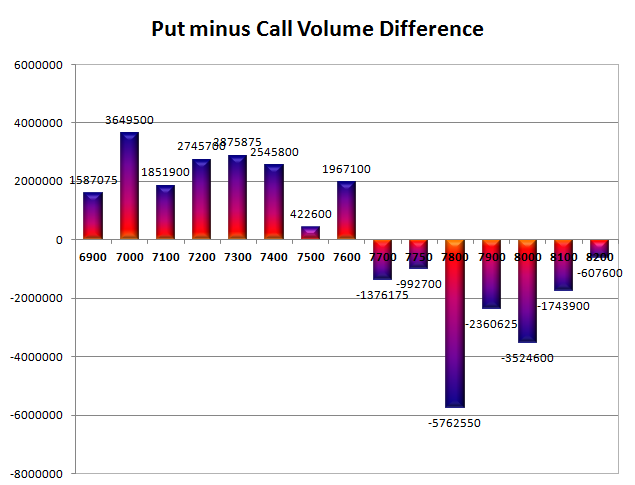 The broader market was positive with 814 advances to 753 declines. The range has narrowed down to 7300-7700. Call option 7700-7900 added 5.89 lacs OI with short covering seen at 7600 and below strike prices. 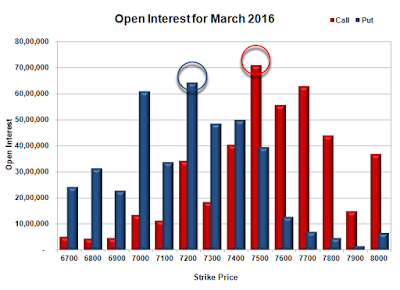 Put option 7700-7300 added huge 24.94 lacs OI with profit booking seen at 7200 and below strike prices. Nifty Open Interest is at 2,22,60,225 up by 7,71,525, with increase in price, most probably huge long build-up. 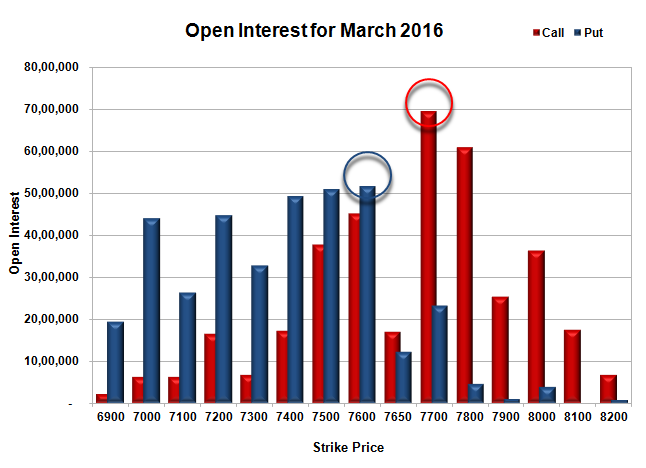 Bank Nifty Open Interest is at 21,56,070 up by 2,89,110, with increase in price, most probably huge long build-up. FII’s bought 1.92 lacs Futures, which includes net 16113 contracts long build-up and 8419 contracts short build-up, with increase in net OI by 24532 contracts, includes 41803 longs to 34109 shorts for the day. FII’s Index future open contract as on date is 221752 Longs to 139126 Shorts, Net 82626 up by 7694 contracts. 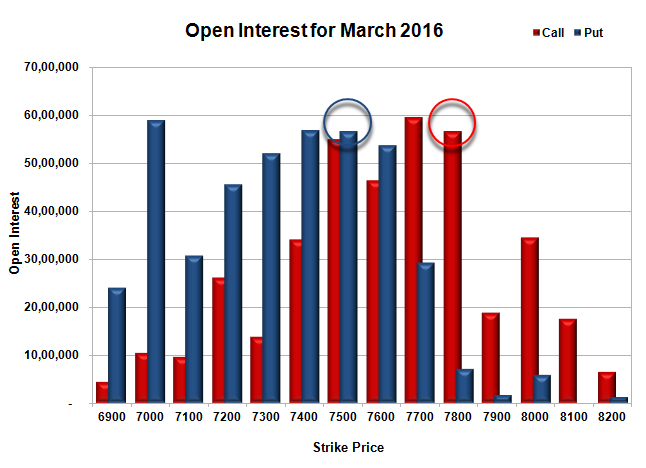 Initial support at 7500, with OI of 59.00 lacs and below that at 7400 with highest OI of 72.72 lacs. 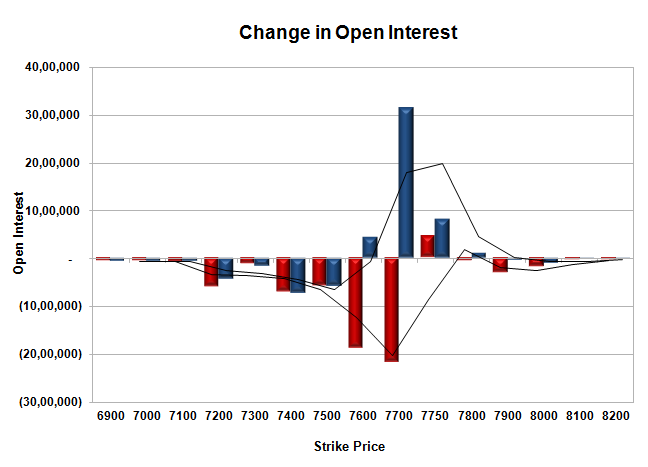 Initial and best resistance at 7700, with OI of 68.87 lacs and above that at 7800 with OI of 47.15 lacs. 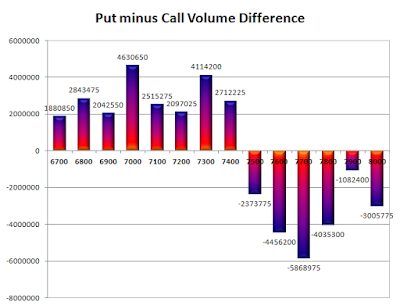 Day Range as per Option Table is 7506 - 7662 and as per VIX is 7539 - 7670 with 7579 as the Pivot. 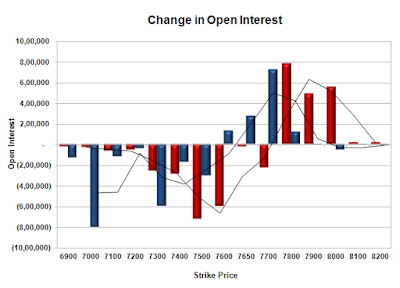 The index opened strong just below 7600, but saw profit booking from the onset to close near the lows of the day at 7512.55, still a gain of 13.80 points. The broader market was positive with 823 advances to 714 declines. The range stays at 7000-7700. 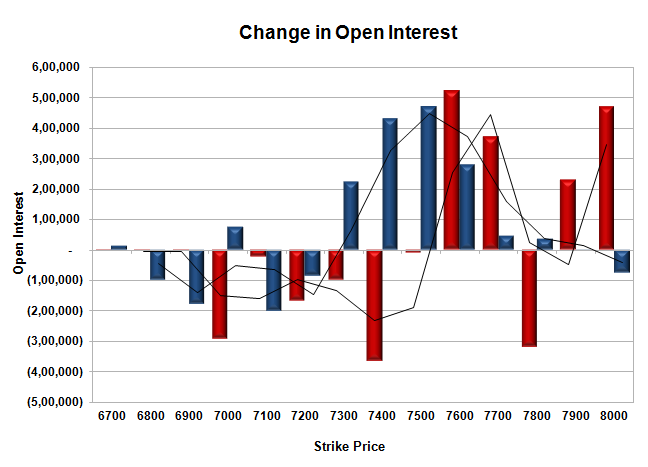 Call option 7500-7600 added 6.05 lacs OI with short covering seen at 7400 and below strike prices. 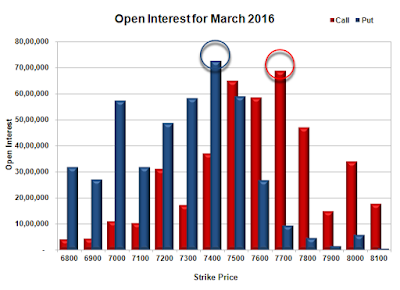 Put option 7700-7300 added huge 28.36 lacs OI with profit booking seen at 7200 and below strike prices. 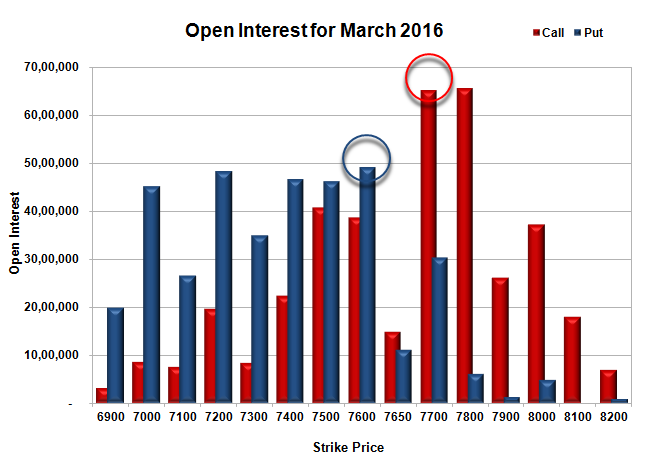 Nifty Open Interest is at 2,14,88,700 down by 2,28,600, with increase in price, most probably short covering. Bank Nifty Open Interest is at 18,66,960 down by 16,890, with decrease in price, most probably long liquidation. FII’s bought 2.68 lacs Futures, which includes net 7100 contracts long build-up and 3639 contracts short covering, with increase in net OI by 3461 contracts, includes 42361 longs to 31622 shorts for the day. 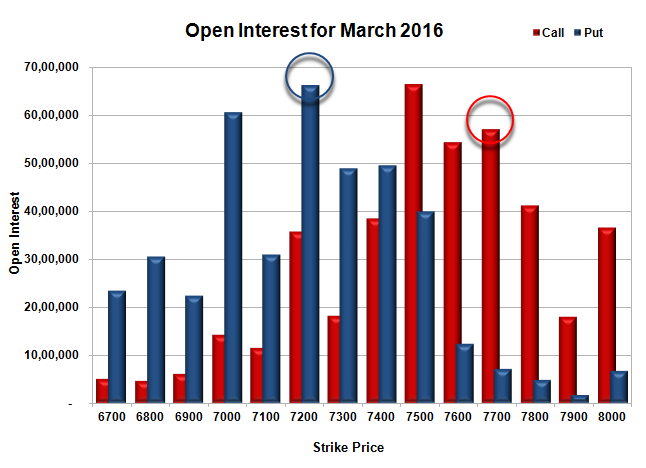 FII’s Index future open contract as on date is 205639 Longs to 130707 Shorts, Net 74932 up by 10739 contracts. Initial and best support at 7400, with OI of 66.09 lacs and below that at 7300 with OI of 58.15 lacs. 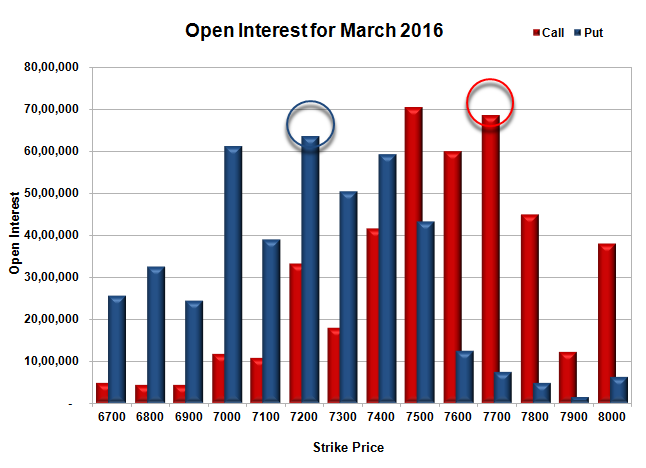 Initial and best resistance at 7500, with highest OI of 71.32 lacs and above that at 7600 with OI of 65.21 lacs. 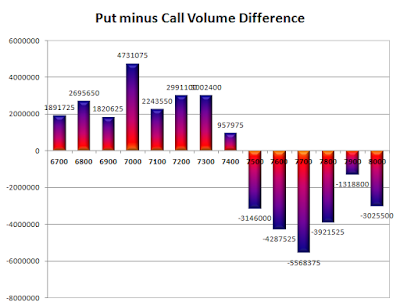 Day Range as per Option Table is 7442 - 7599 and as per VIX is 7446 - 7579 with 7526 as the Pivot.